Whitebeams (Sorbus spp.) are beautiful trees characterised by their white-backed leaves, white blossom produced in the spring and bright red/orange berries in the autumn. 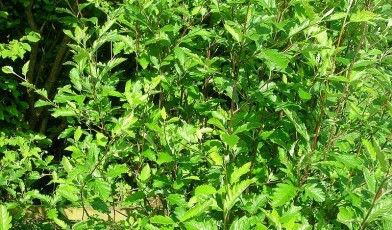 Sorbus pseudofennica is one of Scotland’s most threatened Whitebeams. It is found only to the north of the Isle of Arran alongside another threatened Sorbus species, Sorbus arranensis or the Arran Whitebeam. The species is thought to evolved in isolation on the island since the last glaciation nearly 11,500 years ago, and have been a component of local woodland for thousands of years. Today the Arran Service-tree population is limited to steep-sided gorges and rocky outcrops in the northern part of the island. The overall population is not expected to hold more than 436 individuals and of these only 200 are considered to be mature trees capable of reproducing. The other trees are small and have no flowers. Currently the species has habitat range of just 16 kilometers squared and is threatened mainly by habitat loss. A decline in the surrounding woodland has exposed the species to harsh weather conditions and grazing pressure. Strong winds and heavy rain are common on the Isle of Arran, damaging the trees and stunting their growth (which in turn leads to a loss of reproductive potential). Trees are also threatened by grazing from hare and deer. Conservation efforts aim to increase the surrounding woodland at the sites of S. pseudofennica to provide greater shelter to the trees and reduce soil erosion. At the largest site of the species, Glen Diomhan, a deer fence has been erected to reduce the threat of grazing on the species. There has also been some limited replanting efforts. The Vietnamese golden cypress was discovered as a new species to science in 1999.